Did you visit the Show Topics page? Where do you present the Shows? What are the fees and which topics do you have? Insurance, Working with Children Check​? The fees are listed at the bottom of this web page. For show topics, please visit here. Usually up to 100. This will depend on the venue but smaller is definitely better as students are closer to the action and we will have a better interaction. We do reserve the right to limit the number of students for safety reasons. For Science Nights and special events the attendee number can be higher. In the hands-on workshops, we restrict the size to 30 students. Yes. The minimum fee per visit is the cost equivalent of two sessions (2 x $520 plus GST). If you are from a small school (less than 70 students in the cohort) then please try to find another Year group to take up the second session. There may be a small fee depending on the selection of their topic. Please discuss with your colleagues. All Shows are presented by Carl Ahlers, scientist, educator & science communicator holding an MSc in Chemistry and Bachelors in Education. He frequently delivers talks at Labtech and Science Teacher Conferences and has welcomed over 1 million at his presentations over the last 24 years. More information on Carl’s work here. Safety is of great importance. We have extensive experience in bringing these School Shows to more than 1 million students in 24 years, without any incident. Nevertheless, we carry full Public Liability Insurance to a total of $30 million. A certificate of currency can be provided. Carl has a current “Working with Children Police Check”. We can provide the school with a Risk Assessment or Job Safety Analysis. Please email us to enquire. We specialise in Chemistry & Physics but can customise an engaging interactive presentation with appropriate content. We have successfully delivered sessions on “Scientific Discoveries”, “Change”, “Innovation”, “Product development” and others. Please let us know what you have in mind. Our content aligns with the new Australian Curriculum. If you have a special focus, please let us know so we can plan for the visit, so you get the best outcome. We will have a new item on offer soon! It is our Science in a Box, a pizza box filled with science toys that will engage and teach while the students are having fun. The content is selected for students 6 to 12 years and is offered at a price so each one can have his own box. There will be two boxes: a Chemical Sciences box and Energy & Forces box. 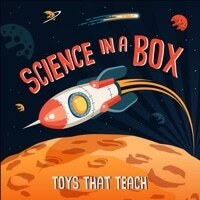 Students take their boxes home as it has full instructions and scientific-play ideas so the learning can be extended. All drafted by Prof Bunsen Science. Our fees are based on sessions and not on the number of students. Our standard Science Show fee for a 1-hour session is $520 plus GST (schools are refunded the GST by the ATO). This is for a session of between 20 and 100 students, so costing starts at $5.20 / student depending on your numbers. [If you are planning to have more than 100 in a session, then please request a quote]. We travel from Melbourne’s west (Point Cook area). A travelling/toll fee may apply if we travel beyond the following suburbs: Lara, Craigieburn, Eltham, Ringwood, Dandenong. The fee is usually $50 plus GST per visit but will depend on the distance and time. Please send us an email to inquire. A cancellation fee applies to all confirmed bookings cancelled less than 3 weeks to the date. This is calculated at 40% of the total fee. – We only have one presenter, Carl Ahlers, aka Prof Bunsen. No other substitutes! Please book early. No deposit is required before our visit. We will email an invoice after our visit for payment within three weeks. If you require a school purchase order number on the invoice, please forward that to us. © 2019 - Prof Bunsen Science. All rights reserved.